Fresh dairy, and fresh starts. Recipes and savings that make the grade. September’s coming. Fall into a routine. September can feel like the beginning of the year. It's back to school, back from vacation, and back to a fall routine. Routines can be wonderful. They save us time and mental energy by eliminating menial and time-consuming decisions. They also help us keep on top of healthy habits. See the recipes and savings we've put together to help with your routines. And start this new season with a new plan and energy. For many families, dinner is more than a meal. It’s time for social interaction, made better by delicious, high-quality food. 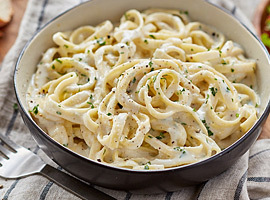 This Smooth & Creamy Low-Cal-Fredo is a light version of Fettuccini Alfredo. Don't unwind with TV and Internet. Studies show that spending time with friends is one of the most effective ways to reduce stress. 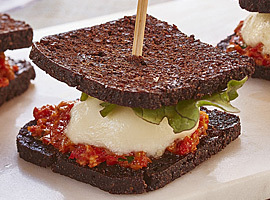 Make your social time even more rewarding with these Savoury Bocconcini S'mores. Eating breakfast is part of a good morning routine. It will help you jumpstart your metabolism, and give you the energy you need to get on with the day. 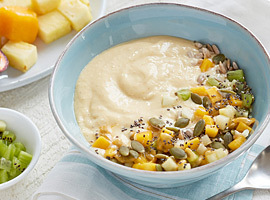 Make the most of a good habit with this energizing Tropical Smoothie Bowl. Kelly Brisson started her blog “The Gouda Life” in 2007, she says she had no idea she’d still be doing it 10 years later. Here are her eight answers on how to make back to school easier. 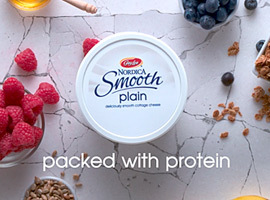 Introducing Nordica Smooth Plain. It’s high in protein, low in calories, and the perfect new base for your favourite recipe. 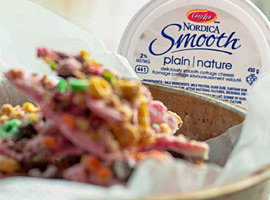 Just add berries or syrup for a healthy breakfast parfait, try it as a dip, or in baking and cooking. Pack lunches that pack protein. Nutritious and delicious. 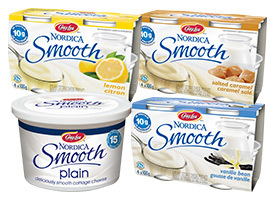 Save $1 on Nordica Smooth Lemon, Vanilla, Salted Caramel, and new Smooth Plain! You are receiving this email because you opted to receive email communications from Gay Lea Foods Co-operative Ltd. through our website or other communication channel. You may unsubscribe at any time by clicking the link below.